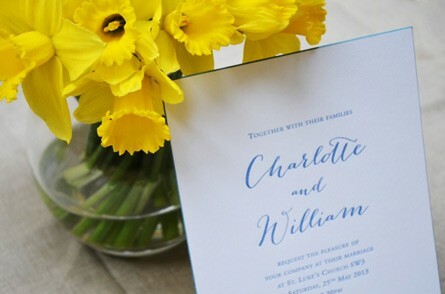 When it comes to simple sophistication look no further than our charming Lottie Wedding Invitations. 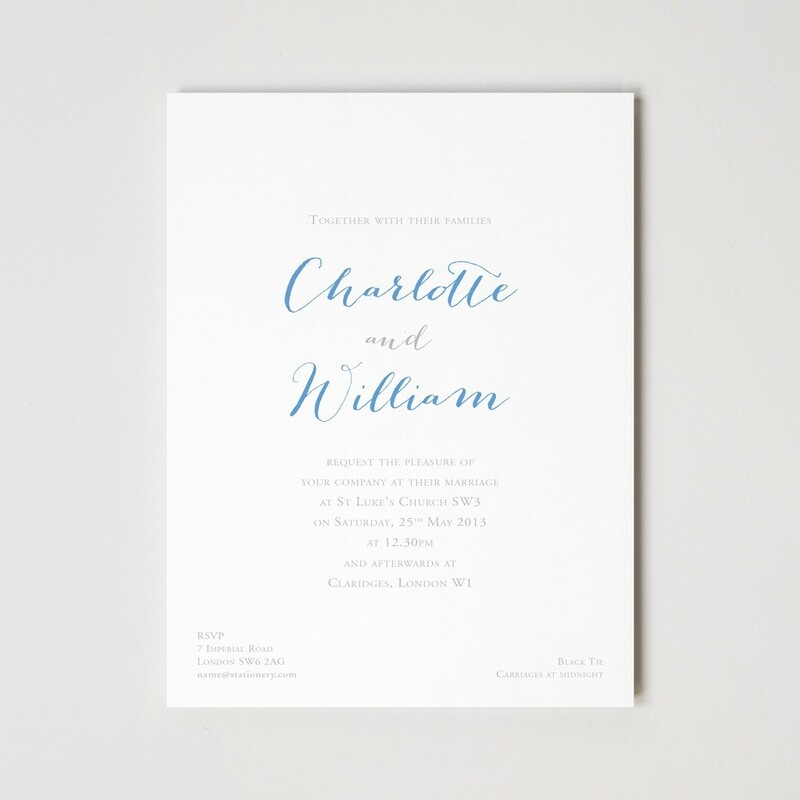 Perfect for traditional summer weddings, the Lottie Wedding Invitation is expertly created using a traditional letterpress on 540gsm paper stock. Complete with matching envelopes, our Lottie Wedding Invitations measure 203mm by 152mm. Orders are shipped by Royal Mail, first class recorded delivery. Larger items are shipped by DPD 24-hour delivery. For overseas orders please email for a quote. Do you offer delivery outside the continental US? Chelsea Fine Stationery will post orders within Europe and overseas. Please email us or ring +44 20 7610 9292 for a quote. How long will it take to receive my personalised stationery? Your order will be ready 7 to 10 working days after your order has been placed. If I haven't received my shipment, who do I contact? In the unlikely event of non-delivery please wait 20 working days from the date of artwork approval and then ring or email our offices and we will track the order for you. UK orders are posted by Royal Mail recorded delivery or by courier and require a signature on delivery, for this reason, it is not possible to deliver to a PO Box address. Will you ship to a different address than the one that appears on my credit card? Yes. Customers may register a separate shipping address on the website or contact us via phone or email with the new details. Yes, all prices are inclusive of VAT where applicable. Chelsea Fine Stationery uses industry standard 128 bit SSL encryption to protect your sensitive data. Chelsea Fine Stationery does not store your credit card information on our servers, providing an additional layer of security. Which credit cards or payment types are accepted? Chelsea Fine Stationery welcomes all major credit cards including Visa, MasterCard, Maestro and American Express. Your credit card will be charged upon placing your order. Once you have submitted your order, a Chelsea Fine Stationery team member reviews your order for completeness. If everything is correct, we will email you a black and white PDF proof of your artwork for your approval usually within 2 working days of receiving your order. Once approved your stationery will be printed. We aim to dispatch personalised stationery orders within 7 to 10 days from approval of proof. Placing an online order is very easy. Follow these steps: 1. Choose the stationery product 2. Select the quantities required. You will then be presented with a series of steps to pick the quantity you would like to order, the print style, the card colour and ink colour etc. 3. Provide your personalisation details along with any special requirements. 4. Proceed to the checkout where you will enter your personal and payment information, review your order, and then submit your order. Do you offer a discount for large quantity orders? Our pricing for most printed items is scaled so that large quantity orders receive a discount. If you require a quantity greater than 500, please contact us for a quote. Will I see a proof of my order before printing? Can I see a printed proof before completing the order? No. You will receive a black and white paper PDF proof in order to review the artwork. Once approved your stationery will go to print. Who do I contact if my order is wrong or there are missing items? Please contact us if there are issues with your order, we will do our best to rectify the situation. Who do I contact if my order is damaged? If for any reason the product does not meet your expectations, please return it with proof of purchase within 30 days from receipt and we will arrange for an immediate exchange or refund. We regret that we are unable to offer refunds on items that have been personalised, because of this, we take great care to ensure the accuracy of each order before printing. Of course, if an error is made by Chelsea Fine Stationery or our supplier, we will promptly correct or replace the items at no cost to you, or you may choose to keep the order as is and receive a refund or credit note for a portion of the original price paid. How to I update or change my order? If you need to make any changes to your order after it has been submitted, please contact us. Yes! Please ring us on 020 7610 9292 Monday to Friday, 9 am to 5 pm. If for any reason, you need to cancel please let us know as soon as possible. If work on a personalised item has not been started then we will be able to offer a refund. If work has begun on your personalised order then you will be you will be responsible for the costs of all work completed up until the point of cancellation, with the minimum charge being £25. Once a proof has been approved for printing, we will not be able to refund any portion of your payment. Are all prices listed in pounds sterling? Yes, all prices are listed and charged in pounds sterling. Do I have to register with Chelsea Fine Stationery to order online? We do ask you to provide registration details at time of ordering as these are used to confirm orders and proofs and provide shipping and billing addresses. While you do not need to register as an ongoing user of Chelsea Fine Stationery, if you do register a user name and password, your details are securely kept with us to enable faster orders with subsequent purchases. Please note we do not keep credit card details from our online registration and purchase process. Our registration page is presented once you have selected one or more products and are proceeding to the checkout pages. Please go to the login page and click on "forgot password." You will receive an email with a password reset link. If you need further assistance, don't hesitate to contact us. How do I update my mailing address or email? Please click on my account. What is the difference between my shipping and billing addresses? The billing address is the registered address that your credit card company sends your monthly statements to. The shipping address is the actual location our products are shipped to. When can I reach someone regarding my order? You can ring us on +44 (0)20 7610 9292 Monday-Friday 9am-5pm GMT. After hours you can leave a message on the answering machine. What is Chelse Fine Stationery's email address? Have a question? Please email us at info@chelseafinestationery.com. Any feedback on our products or website is also welcome. What is Chelsea Fine Stationery’s mailing address? CHELSEA FINE STATIONERY, WEST LONDON SHOWROOM, STUDIO 4, 305 GOLDHAWK ROAD LONDON W12 8EU United Kingdom. Can you help me with a bespoke order? Yes! We have a team of designers who are happy to work with your ideas to create the perfect invitation or announcement. How do I find the products I want? To browse our selection of products from the Home Page, click on any featured item to take you directly to that product's detail page. This is where you can view the product more. Any related products may also be shown. From this page, you can select and personalise the product. You can also search by name, colour, type or keyword. How do I provide feedback on my shopping experience? What is your "Bespoke Design Service? Our design team will work with you to create a unique invitation or announcement and provide advice on paper, ink color, printing method, embellishments, and personal touches such as a specially themed design. Ring us on 020 7610 9292 to set up a complimentary private design appointment. We offer a variety of printing techniques, from traditional to modern. Our printers are some of the finest in the country with years of experience. Also known as flat or offset printing. Ink is rolled onto a rubber cylinder and then transferred to the paper. The result is sharp, clean, and a bit more casual. It is less expensive than thermography and most often used on correspondence cards, informal party invitations and announcements. A centuries-old technique in which a printing plate presses the ink down into the paper, leaving a crisp debossed impression that is enhanced by the tactile qualities of the paper on which it is printed. The most traditional method of printing. A printing plate is pressed up from the back of the paper. This leaves slightly raised letters on the front, slightly indented on the back. Perfect for formal invitations and smart stationery when a distinquished and smart result is required. Created to imitate the look of engraved printing at a more economical price. Sometimes called raised printing, thermography is achieved when a powdered resin is applied to wet ink and heated to create a raised surface. Ideal for headed writing paper, wedding and classic invitations. A form of dry printing. A plastic film of coloured pigments (metallic or matt) is heated and pressed into the paper. Ideal for coloured card invitations. This flat printing method that works on the same principle as photocopying. A series of coloured dots (known as CMYK) are applied to the paper in one go. Digital Printing is a less expensive option for multiple-color printing and for photographs cards. The quality may vary and thick card cannot be used.